Murder by Gaslight: A Mystery in Pittsburgh. Police Lieutenant Snyder, walking down Frankstown Avenue in Pittsburgh’s East End, around one a.m. on January 8, 1889, heard a gunshot from the house of Albert Davis, a well-known African American restaurant owner. The Lieutenant forced his way inside and found Davis lying dead at the bottom of a staircase. A revolver lay on a table next to several empty beer bottles. Standing near the body in their nightclothes were Carrie Palmer and Mollie White, both African American. Mollie White, a girl no older than 14, said she had been awakened by the shot and saw Davis fall down the stairs, but knew nothing of the circumstances leading up to his death. Carrie Palmer refused to give any information. How the people in the house were related was not immediately clear. Carrie Palmer was also known as Carrie Davis, and the newspapers reported that she was living with Davis as his wife, implying that they may not have been legally married. She later testified that she and Davis were married in 1880. Carrie’s sister had been visiting until nearly midnight; Mollie White shared Carrie’s bed that night and may have been her niece, but it was never stated. At the inquest, Mollie White elaborated her story saying that when she went to bed at 11:50, Davis was in the corner reading a book. She heard nothing until the pistol shot awakened her, and then she saw Carrie running from the room with Davis running after her. He did not get far before falling on his face down the staircase with blood pouring from his mouth. Cable W. Nicholas, Davis’s partner, was also at the house that night. He and two other men were in the room below when the shot was fired. Nicholas testified that the couple frequently quarreled and he had heard them threaten each other’s lives. Carrie Davis, alias Palmer, was indicted for the murder of Albert Davis. The trial of Carrie Davis began on July 3, 1889 (by now the newspapers had stopped adding “alias Carrie Palmer” to her name). The prosecution presented a circumstantial case against Carrie. 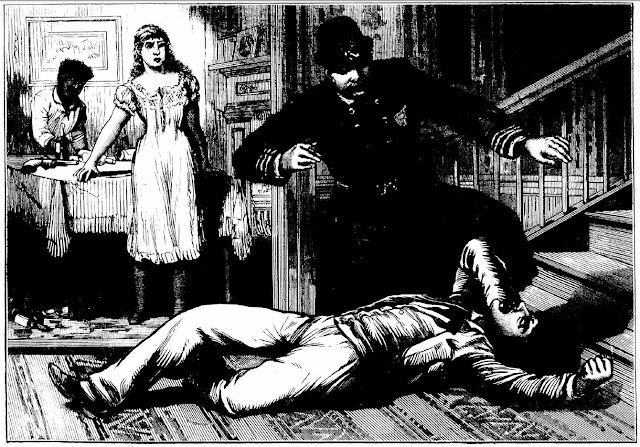 The post-mortem doctor testified that the lack of powder marks on the body made suicide impossible, but Carrie believed that Albert had shot himself. On the stand she said that, like Mollie White, she woke when she heard the gunshot, but she remembered nothing that happened after. Attorney Brooks, a good friend of Albert’s, testified that Albert had a “jolly disposition” but on that night was downhearted and melancholy. Other defense witnesses testified that they had seen Albert wiping tears from his eyes. In his closing statement, Carrie Davis’s attorney stated that by the rules of circumstantial evidence, it was just as likely that Mollie White killed Albert Davis as it was that Carrie Davis did. More to the point, he asserted, the prosecution had not proven that Albert hadn't committed suicide. The jury believed the prosecution and found Carrie Davis guilty, but of second-degree murder, not first-degree as the prosecution sought. She was sentenced to ten years in the penitentiary. "A Mysterious Murder in Pittsburg." Harrisburg Daily Independent 8 Jan 1889. "A Mystery in Pittsburg." Harrisburg Telegraph 8 Jan 1889. "Committed for Murder." Pittsburgh Daily Post 10 Jan 1889. "In the Criminal Court." Pittsburg Dispatch 7 Jul 1889. "In The Second Degree." Pittsburg Dispatch 4 Jul 1889. "Probably a Murder." The Daily City News 9 Jan 1889. "Said to have Suicided." Pittsburgh Daily Post 3 Jul 1889. "The East End Tragedy." Pittsburg Dispatch 9 Jan 1889. "They Charge Her With it." National Police Gazette 2 Feb 1889. Going by the info given, I'd have to agree with the defense. But if Carrie didn't do it, who did? May I ask.. Why are several of these posts subtitled "The Little Murders?" Thank you. I really enjoy your articles. When I first started this blog it focused on famous murders with detailed narratives, usually a court case and often an execution. As time went on I added lesser known murders with much less detail and to distinguish the two I called the shorter posts "Little Murders." Now "Little Murders" are pretty much all I do so I dropped the name. Thank you for your clarification! And your blog. Very interesting stories.